John Bottega retold the 2008 financial crash as a data management crisis. Defaults on mortgages initiated the crash, but, he recounted, it became a crisis because of insufficient data about those defaults. Mortgage loans were abstracted into multilevel derivatives and default swaps. Due to prevailing data practices, important data was lost at each abstraction. In one case, derivative risk evaluators didn’t know which loans packaged into a security were from first time homebuyers. Much of the panic resulted from banks flying blind as to the risk in their portfolios. Dataversity founder Tony Shaw led John Ladely, Anthony Algmin, and William A. Tanenbaum in a truly scary improv about the creepy illegal — and sometimes legal! — possible outcomes of installing a fictional “mannequin data as a service” with cameras and microphones to track customers and employees in a retail setting. Jeff Crooks, jack of all data trades and data warehouse leader at Race Trac Petroleum, showed how he brings serious business value from integrated data. His team’s reports from the warehouse have brought new accuracy to sales tracking and have enabled the company to identify and eliminate loyalty reward fraud. Peter Aiken, a conference founder, and Linda Powell of the Consumer Financial Protection Bureau recounted many stories in which effective data management had made positive impacts in peoples lives. Peter’s company, Data Blueprint, worked with the military integrating data to help reduce veteran suicides. The CFPB used published data analyses showing that even though credit rating agencies reduced credit ratings due to medical debt, medical debt did not correlate with higher credit risk. Upon reviewing CFPB’s research the credit agencies voluntarily changed their policies so that health care expenses didn’t reduce credit ratings. These and many other speakers spoke to the competitive advantage of organizations that manage data effectively, but all acknowledged that we have a long way to go. Four leaders of the field laid a foundation for those efforts by introducing the “Leader’s Data Manifesto“. Presenters John Ladley, Kelle O’Neal, Danette McGilvray, and Dr. Tom Redman, developers of the manifesto along with James Price, challenged the business community to get serious about data, and the data community to get serious about leadership. The info-graphic style manifesto, pictured and linked above, describes the state of the practice and explicitly demands action from anyone who “needs data to do his / her job”. In short, all must become “data provocateurs”, leading from high or low on the corporate latter, as the case may be, to spur tangible progress toward managing data as the asset that it is. This is certainly not the only data-related manifesto around. I’ve got one here specific to data warehousing. Peter Aiken’s contrasts data management with software development mirroring the Agile Manifesto. This one from the Royal Statistical Society recommends data practices for the UK government. 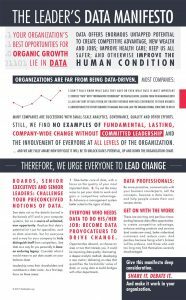 As a mission document for the data community the Leader’s Data Manifesto is better than the alternatives, including mine. It is vast in scope, encompassing everyone. It is business focused, for Leader’s about Data not just “Data Leaders”. And it is specific, clearly detailing what each of us must do to improve data management. I encourage everyone to read the Manifesto, sign it, and go forth and create positive change.